Speechless, humbled, and amazed are few words that were used by our team to describe the day. Today was our 'first day' on the field as a team, and it was a good one. Our team has had a bond from the beginning of planning this mission trip, but it is already growing immensely just after what we have seen and experienced today. We went to our first two Orphanages', and to The Home of the Sick and Dying Infants..... Again, I am speechless. We held these infants and children, played jump rope, colored with chalk, watched them giggle at the bubbles, kicked the soccer ball, and prayed over them. These kids just want someone to love them, to hold them, to hug them, to play with them. At the first orphanage, all 6 toddlers that we were playing with, fell asleep in our arms which may have been one of the most beautiful things to see, as they are so relaxed and comforted by our presence. People at home will do anything to lose weight because we are more focused on what people think about us - these kids in Haiti would do ANYTHING to gain weight, to be able to eat a piece of bread or any kind of food. People at home complain of city water tasting bad, or our water furnace going out - these kids and people in Haiti would do ANYTHING to have water at the tips of their fingers to drink so they can stay hydrated and to cleanse their bodies with. 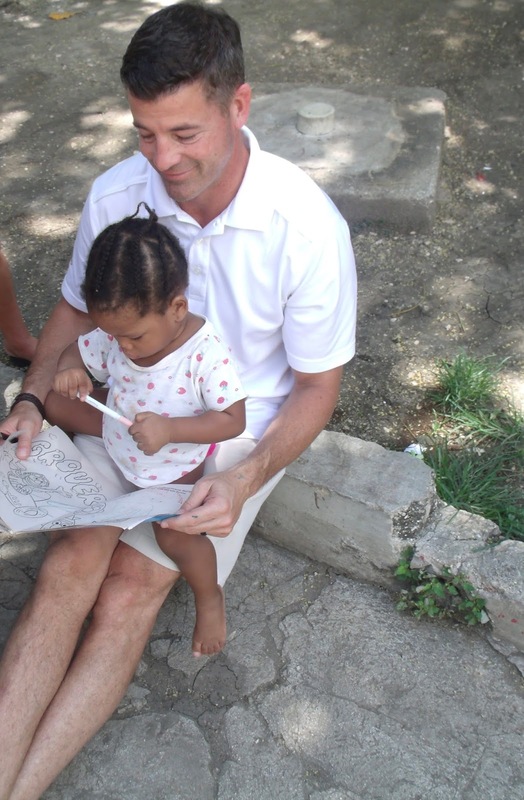 People at home worry about buying our children the nicest Christmas and birthday presents - these kids in Haiti would do ANYTHING to have a soccer ball to play with, a coloring book to color in, or chalk to draw with. It puts a lot of things into perspective for me and leads to question what is important to me? God is working in mighty ways through our team and touching the lives of the people in Haiti, and it's only the first day. As we venture off to be the hands and feet of Jesus in the days to come, I can only imagine we will become more speechless, emotional, but most of all grateful. Thank you for all the prayers from our families, friends, and church community and those who made it possible for us to be here. We will keep you in our prayers and hope to come home and change the world a little at a time from our humbling experiences and the Holy Spirit encounters we have during our time here.